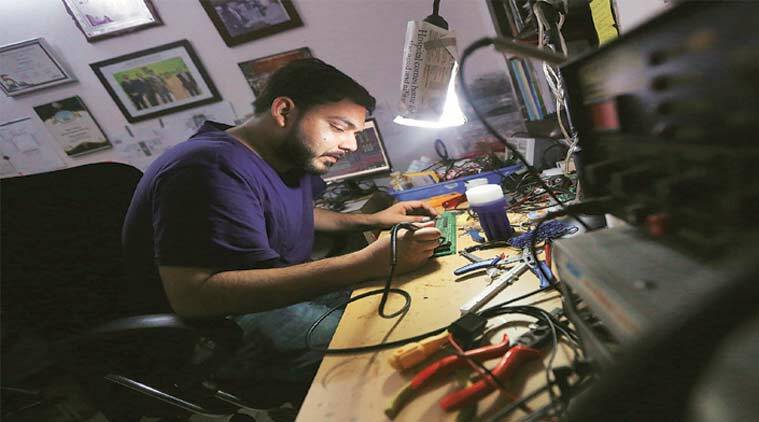 Diploma exams 2019: Many students who want to make their career in the technology field choose polytechnic courses because it gives them an easy door to get a job without giving two years in class 12 or higher secondary. The students after completing polytechnic courses can also take admission in their Bachelor’s degree through lateral entry admission. Joint Entrance Examination Council of Uttar Pradesh (JEECUP) has opened JEECUP 2019 registration at jeecup.nic.in. Applications are invited for the UP Polytechnic 2019 entrance exam that will be held on April 28, 2019. JEECUP is the state level polytechnic entrance exam that leads to diploma courses in 559 polytechnic institutes in Uttar Pradesh. Age limit: While there is no upper age limit, there is a minimum age limit. To be eligible, a candidate needs to be at least 14-year-old on July 1, 2019. Domicile: Candidates need to be domicile of Uttar Pradesh or parents of the candidate are domicile of Uttar Pradesh or either of the parents of the candidate is an employee of Central Government and currently posted in the state are eligible to apply. Candidates will need a coloured photograph with the name of the candidate and date of taking the photograph printed on it. The picture should not cover the eyes or head of the candidate, that is, the candidate should not be wearing glasses or cap/hat. DTE Karnataka is likely to start the online application process for polytechnic 2019 exams from the first week of May. The computer-based test which will be conducted on all India basis across the country to facilitate the students to appear in the test closer to their homes and is aimed at minimising the cost of travel and other logistics. This engineering entrance exam is held for candidates seeking admission to various diploma engineering colleges in Karnataka under the Karnataka Unaided Private Engineering Colleges Association (KUPECA). Engineering – Candidates are required to have cleared the Class 10 (Secondary) or equivalent exam from a recognised Board. Also, they need to score at least 45 per cent (40 per cent for reserved categories) in their board exams with science subjects. 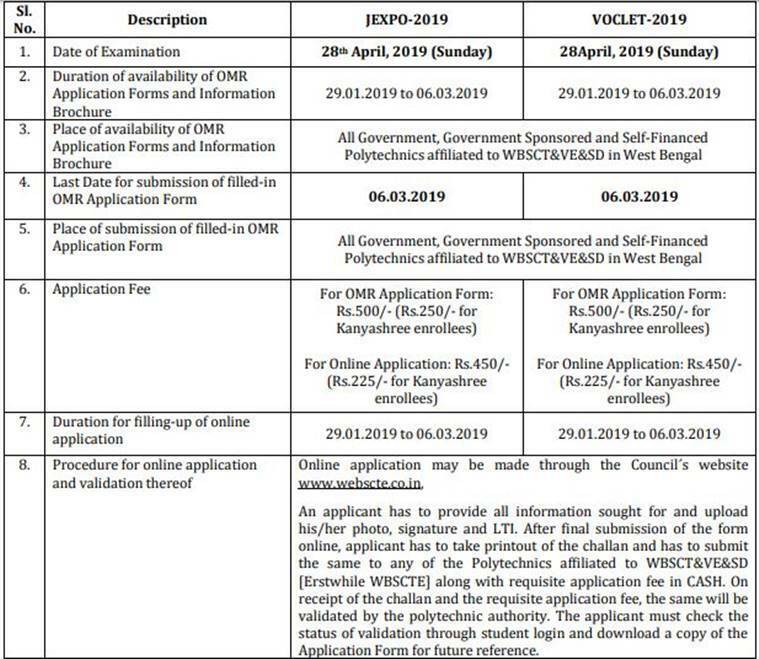 The West Bengal State Council of Technical & Vocational Education and Skill Development has announced the application process for the JEXPO and VOLCET entrance examinations 2019. The online admission process has already started in January, the candidates can apply through the official website, webscte.co.in. Both the JEXPO and VOCLET examinations will be conducted on Apri 28, 2019. The candidates can apply through the official website, webscte.co.in till March 6, 2019. Through JEXPO, admission will be provided to the first year classes of diploma in engineering and technology and through VOCLET, admission to second year classes will be provided. The application forms for the same can obtained from all government, government-sponsored and self-financed polytechnics affiliated to the institute. Educational qualification: Aspirants should have passed/appeared in class 10 examination with at least 35 per cent marks in aggregate without the marks of the additional subject (without rounding up). Mathematics, physical science and English are mandatory subjects in the qualifying examination. Age limit: Aspirants should not have been born after July 1, 2003. There will be two papers comprising “mathematics (first paper)” and “physics and chemistry (second paper). Multiple Choice Questions (MCQ) will be asked. There will be two papers comprising “mathematics, physics and chemistry” (first paper) and “mechanics and computer” (second paper). Multiple Choice Questions (MCQ) will be asked. The Delhi Department of Training And Technical Education (DTTE) will advertise for the CET 2019 in the month of March, as scheduled. The candidates who will appear in the examination can apply through the official website, cetdelhi.nic.in. Candidates are selected through the CET based on their performance. The final admission is made according to the order of merit and the preference is given by the candidate in their application. Counselling of candidates will be done at Delhi. The classes will begin in August. The candidates need to possess a Class 10 pass certificate. The Bihar Combined Entrance Competitive Examination Board (BCECEB) is likely to start the application process for the Diploma Certificate Entrance Competitive Examination (DCECE) in February. The candidates who want to appear in the entrance examinations can apply through the official website, bceceboard.com. The candidates need to possess a 10th, 12th pass certificate from the Bihar board or other state boards. The general category candidates need to possess a minimum 35 per cent marks. The reserve category candidates will get age relaxation as per official notification. Earlier on Thursday, the Bihar Combined Entrance Competitive Examination Board (BCECEB) has scrapped the Bihar Combined Entrance Competitive Exam (BCECE) 2019. From now onwards, the entrance to medical and engineering colleges in the state will be conducted through the National Eligibility Entrance Test (NEET) and Joint Entrance Exam (JEE) Main exams, respectively, both of which are conducted by the National Testing Agency (NTA). The Tamil Nadu Directorate of Education (TNDTE) will soon advertise for the Diploma examinations. Those who clear the exam will be eligible for entrance to various polytechnic colleges in Tamil Nadu. As of today, there are about 518 polytechnic colleges in the state. The online application process will be available at the official website,intradote.tn.nic.in. The entrance examinations will be conducted in the month of May or June. The candidates need to possess a Class 10 or 12 pass certificate with minimum 35 per cent marks. The reserve category candidates will get relaxation on marks as per the official notification. The upper age limit of the candidates should not be less than 18 years of age. The Maharashtra State Board of Technical Education (MSBTE) will soon advertise for the MSBTE diploma examinations that is conducted in two halves, Summer and Winter. The advertisement on the admission process is likely to release at the end of January. Last year, MSBTE Summer Diploma exams were conducted from March 28 and ended on April 7 (practical exams) while the theory exams were conducted from April 11 till May 8, 2018. The candidates need to possess a Class 10, 12 pass certificate with minimum 35 per cent marks. The reserved category candidates will get relaxation as per the official notification. Maharashtra State Board of Technical Education is the autonomous board of Maharashtra government. It controls various aspects regarding the quality of technical education being imparted, from industry-institute interaction to national/international collaborations. To basics, the board controls the diploma, post diploma and Advanced diploma education throughout the diploma colleges/institutes in Maharashtra.